Hello and welcome, friends! I'm so grateful to welcome you to this week's Grace at Home party, where we celebrate all the ways we make our homes places of grace. 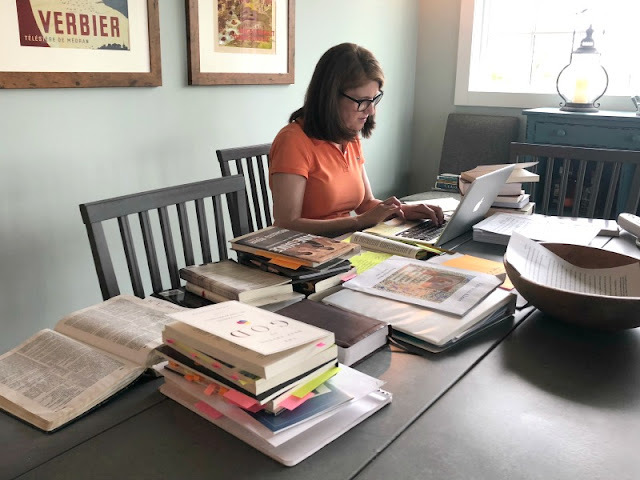 That's me in my natural habitat these days: working on the manuscript of my book. (If you didn't know, I'm thrilled to tell you that I'm writing a book for InterVarsity Press called Mythical Me: Escaping the Trap of Comparison.) My manuscript is due August 1, which is less than two weeks from now! YIKES! I'd surely appreciate your prayers for me as I work like crazy to finish this book. I'm excited about it, and that's a good thing, because writing a book is hard work. I have renewed respect for authors. Congratulations, Richella! That's so exciting. I know it will be a blessing to so many. Thanks for hosting in the midst of it all. Thanks so much for hosting each week, Richella!!! So excited about Mythical Me! I review books for IVP, and will sure be on the lookout for yours! Thank you for letting us share! Praying for you strength and energy as your work on your book! Congrats! I am Mareliz and I blog about Filipino Fusion Cuisine and life in general Thank you so much for hosting. I love reading your thoughts. Good luck on you and your book. Keeping you in my prayers as you complete this project, I love the title/concept, a trap that is so easy to fall into. God bless! Wow!!! I am so excited for you!!! I would love to read your book. Congratulations!!! !